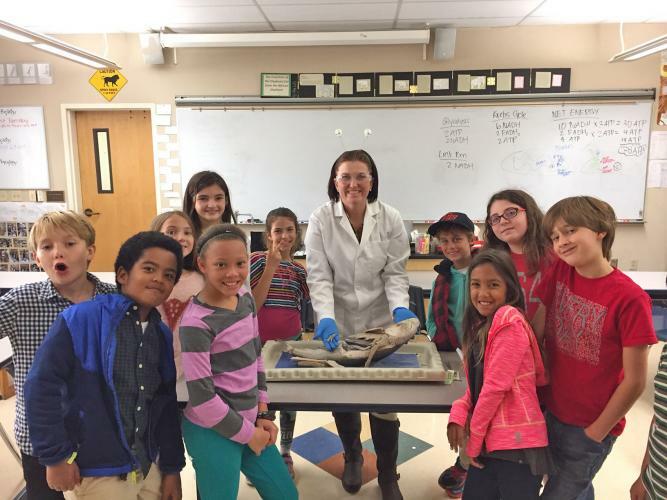 High School science teacher, Dr. Kellie Whited, and Middle School Science teacher, Kelly Bornmann, bring scientific exploration to life in the Lower School. They develop units of study with the classroom teachers and support learning by bringing hand-on activities and labs into the classrooms. A special treat is when Lower School students visit our Middle and High School labs to “do” science with our older students. To complement the curriculum taught by homeroom teachers, professors from Sacramento State University teach labs to each of the grades PK-4. In grade five Country Day students travel to Sac State do a lab using the same facilities that research scientists use. PhUn (Physiological Understanding) Week, a program developed in conjunction with the American Physiological Society and professors in the Biological Sciences department at Sacramento State University, engages our students in an exciting and active exploration of human body systems.